We get asked a lot of questions here at JGG about guitar setups and whether a vintage guitar has a good action, decent frets and working electronics etc. All our guitars go through a complete professional setup before we put them on the site, and we always recommend that you keep your instruments in good shape by occasionally doing the same yourself. 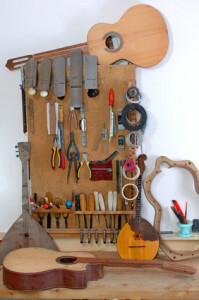 Vintage instruments are by their very nature a product of the period in which they were built and having a reliable (and experienced) guitar technician is essential to keep them in good working order. Some players like to work on their own guitars of course, but you need to have real expertise to do this and we would recommend that unless you are experienced in this way, finding a good reliable guitar tech is the way to go. 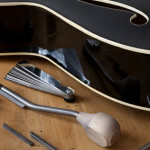 So what can a good guitar tech achieve with your prized instrument? Well firstly you can get the guitar playing the way YOU want it to, if you have a tech who is willing to talk with you about your specific requirements. Before you do this, it’s worth thinking about what you want to achieve with the instrument. What kind of music will you be playing is also worth considering, as for example slightly adjusting pickup heights can make a real difference in guitar tone and your perfect sound maybe be just a small adjustment away. Adjusting a truss rod correctly is also an important factor in getting a guitar playing well and this is definitely best left to an experienced technician. Even a quarter turn on a truss rod can dramatically effect it’s play-ability and if a neck is either too straight (no neck relief) or too curved (too much relief) then you could be in for serious playing issues. Have a look on the internet or in your local telephone directory for a nearby guitar tech. Alternatively ask around as to where all the other local players go with their instruments. You’ll be glad when you find a good tech and your guitar will certainly thank you too!